Job search site Indeed says that it has seen a surge in the number of postings seeking to fill information security roles. Data from the company reveals that ads for cyber security related positions increased 98 per cent during the year compared to 2016; posts have increased 300 per cent since mid-2015, the company said. Indeed said there was evidence that companies were still struggling to find qualified professionals to fill vacancies, with many positions advertised for 60 days or longer and receiving a low level of response from job seekers. 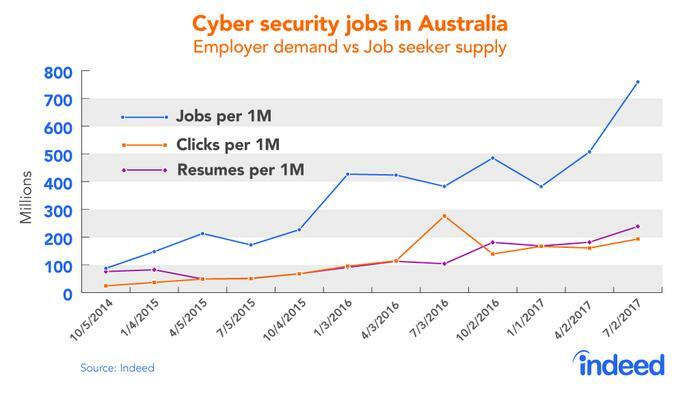 New South Wales accounts for 45 per cent of cyber security job postings, Indeed said, followed by the ACT (23 per cent) and Victoria (17 per cent). However, the company said its data showed that positions in NSW were proving the easiest to fill. Indeed’s managing director for Australia and New Zealand, Chris McDonald, said the security skills shortage “is of course a good thing for those job seekers with the requisite skills in terms of choices they have,” but added that “the fact a number of positions are remaining open for extended periods highlights the ongoing need to deepen the talent pool in what is a highly specialised area”. “Like other areas of IT, employers are looking abroad to attract suitable talent,” McDonald said. According to Indeed’s data, the average salary for an IT security specialist is around $124,000 with more senior roles commanding in excess of $250,000. Addressing Australia’s information security skills shortage is a major plank of the government’s national cyber security strategy, unveiled in 2016. In June, the government announced that the University of Melbourne and Edith Cowan University (ECU) will host Academic Centres of Cyber Security Excellence (ACCSE).